A BIG day in football!! Friday was a BIG day in football for our school! 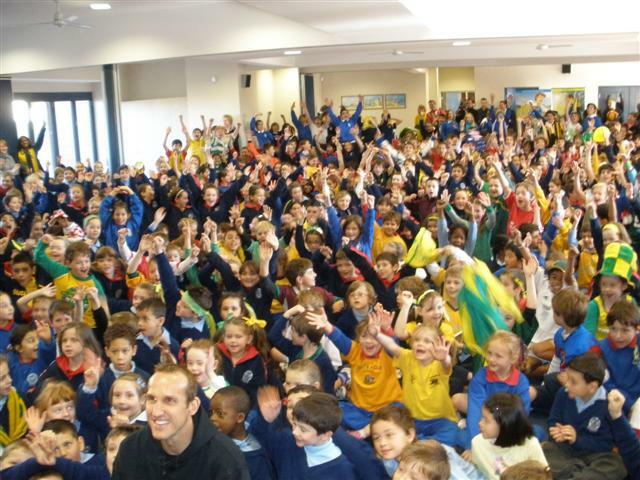 The much anticipated day of Mark Schwarzer’s visit had finally arrived. 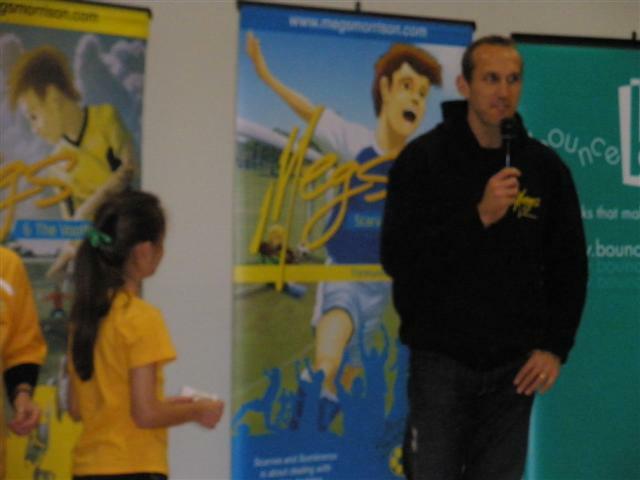 Mark Schwarzer and Neil Montagnana were coming to launch their fourth book in the Megs series called “Megs and the Complete Left Foot”. Mark and Neil’s first stop was the LRC to meet a very excited Matthew and his proud family because Matthew had won Mark’s visit for our school. Neil showed Mark the letter that Matthew had written and sent in with his petition to get Mark to visit our school. Next to meet Mark were an excited group of children who had written letters to me explaining why they wanted to meet Mark. These children had the wonderful opportunity to snuggle in close with Mark and listen to him read the first chapter from his new book. The looks on their faces were priceless and you could have heard a pin drop as Mark read to them. There were also lots of pictures taken with Mark to promote the book. One of the photos was in the Herald Sun on Saturday! By now the whole school was assembled and waiting in anticipation for Mark and Neil. As we walked down to the hall we were greeted by the cheers of “Aussie Aussie Aussie Oi Oi Oi! !” Mark and Neil entered the hall to cheers and a sea of green and gold and an array of soccer jumpers. 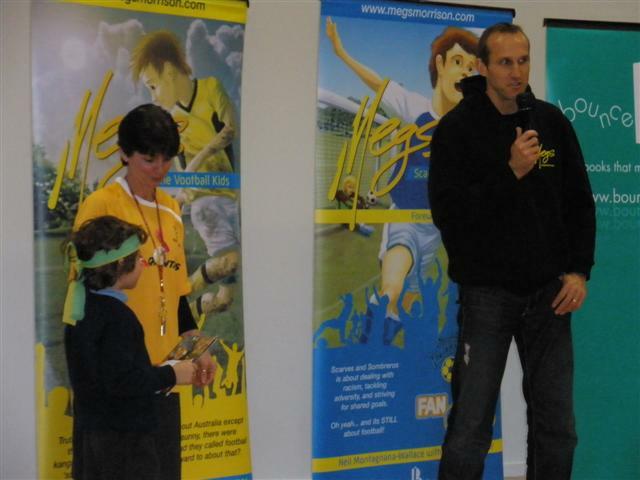 From the responses in the interview we discovered that through Mark and Neil’s shared passion for football they wanted to write books that would encourage children who play sport to pick up a book and read about a sport that interested them. 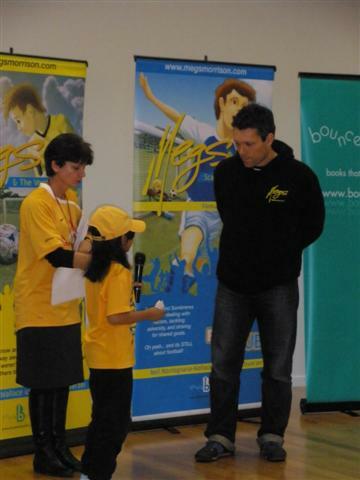 They write for boys and girls because the number of girls playing soccer is steadily increasing. Mark and Neil both contribute to the writing process by using Skype to talk to each other. Mark is a night owl so it is late at night in England when he talks to Neil in the morning here. They are planning one more book in the series to be released next year with the World Cup finals. 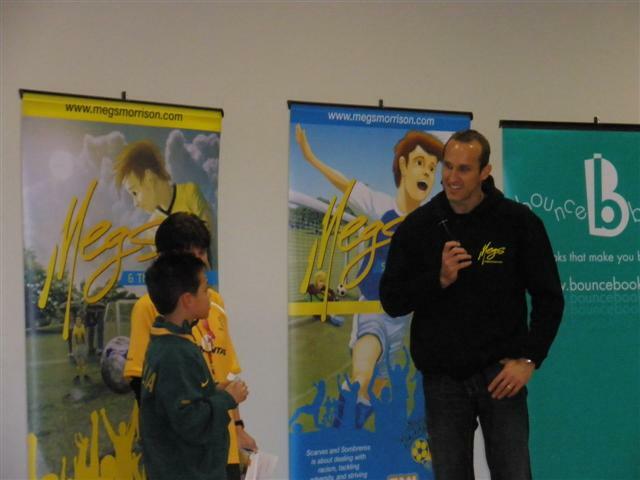 They are currently taking the Megs books on tour through country Victoria. They love meeting their readers and have lots of fun travelling together on their road trip! 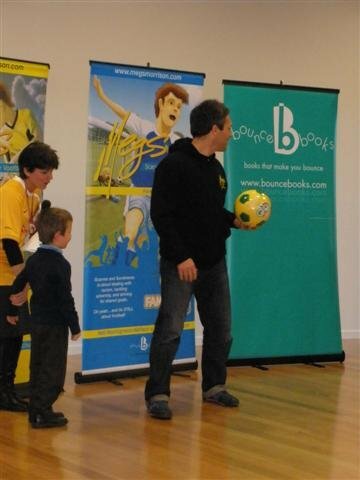 Mark and Neil used Bailey’s football to give us a demonstration of juggling using their feet, thighs and heads. It was very exciting, but I was hoping that Mark wouldn’t injure himself!! About 15 lucky students then had the opportunity to ask Neil and Mark some questions. Neil explained to Monica that is is handy to be both a publisher and author because you get more say in the design and layout of the book, but it is also lots of work doing both jobs. Mark told Bradley that he has been a goal keeper since he was 10 years old. No wonder he is so good because he has been saving goals for 26 years!! Mark doesn’t know how many goals he has saved in his soccer career but he told Caitlin that he hopes he has saved enough goals! Mark laughed when Luca asked if being an international soccer player was as good as it looked. He did say that it is a bit like living in a fantasy world and you have to do normal things with your family. Before we knew it we had to wrap up the interview questions because Mark needed time to sign our books and then fulfil his media commitments. He is very much in demand by the media! 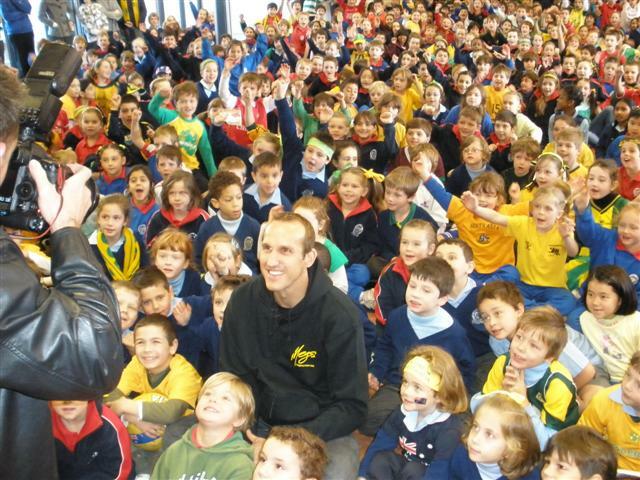 Our Preps got a wonderful surprise when Mark stepped down to sit in amongst them for a photo! We had time for one final cheer for Mark and Neil to say thank you for giving their time to come and visit our school…what an AMAZING morning and a wonderful way to christen our new school hall!! Many of us were very excited to see our school on the Channel 7 and 9 News that night! The students in 4V wrote their reports about Mark and Neil’s visit. You can read some of them below. This entry was posted in Uncategorized and tagged Mark_Schwarzer, Megs, Sport by smotlrcblog. Bookmark the permalink. 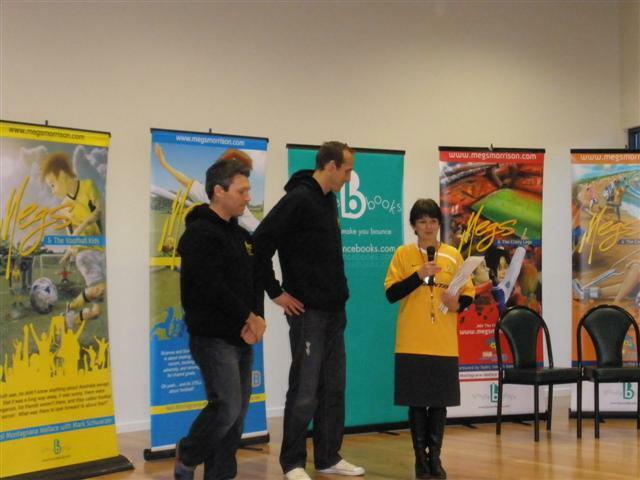 I loved that day that Mark Schwarzer and Neil Montagnana came to school. I had a very fun day and congrats to Matthew. These reports are very good. Mark and Neil’s visit was a great day.I have to say congrats to Matthew. Don’t you think the reports are great? Sadly I was unable to attend the ‘Big Day in Football’ but after reading those reports I now know what the day was like. It must have been awesome fun. Congratulations Matthew!!!! I still remember the big day of football!